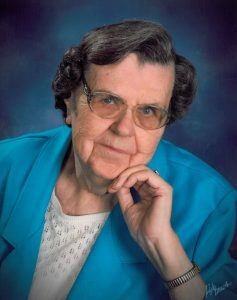 Mary Louise McBride, 84, of Sedalia, passed away Wednesday, April 11, 2018, at St. Luke’s Hospital in Kansas City. She was born November 21, 1933, in Cole Camp, daughter of Fritz and Minnie (Stelling) Schroeder. She was confirmed in March of 1947 at Holy Cross Lutheran Church. Her confirmation verse was Revelation 2:10. She came to live in Sedalia in August of 1958 and worked at SS Kresge Co., House of Fabrics, Katz Drug and Osco Drug. She volunteered at Meals on Wheels and also at Open Door Thrift Store. She married Floyd “Buster” McBride on June 7, 1971, in Hughesville, MO. He preceded her in death in October of 2006. Mary worked with making quilts and laprobes for her church and also did crafts. She was a member of her card club, L.W.M.L. and a former member of Show-Me Crafters. She is survived by her daughter, Angela Thomas and husband Don, of Sedalia; step-granddaughter, Sheila Hall and husband, Dustin; three step-great-grandchildren, Cheyenne, Dallas and Austin Hall, all of Trenton, MO; and many cousins, nieces and nephews. In addition to her husband and parents, she was preceded in death by a step-daughter, Darlynn Lewellen; sister, Willette Borchers; and an infant brother, Leeman Schroeder. Funeral services will be held at 1:00 p.m. Monday, April 16, at Our Savior Lutheran Church, with Pastor Andrew Tessone officiating. Casket bearers will be R.D. Gray, Jacob Chambers, Larry Gregory, Doug Dieckman, Aaron Warner and Arthur “Jr.” Borchers. Honorary bearers will be Ruth Dale, Bob Wiley, Daryl and Sandy Cook, and Ervene Nothwehr. Burial will be in Highland Sacred Gardens. The family will receive friends from 11:30 a.m. until service time Monday at the church. Memorials are suggested to St. Luke’s Cardiac ICU Unit or Our Savior Lutheran Church Radio Ministry. Arrangements are under the direction of Heckart Funeral Home. I’m sorry to hear this, she was such a nice lady. Blessings as you remember your loved one. May God grant you His peace in His time. We will miss the many caring things she did for others and the special crafts she shared with all. I still use her canvas Nativity set every Christmas. God be with you always. Prayers and sympathy for the family! Mary Louise was one of the nicest people I know. May God grant her peace and everlasting life! So sorry to hear about your mother. I’m thinking of you at this difficult time and wishing you comfort and peace. She will be greatly missed.